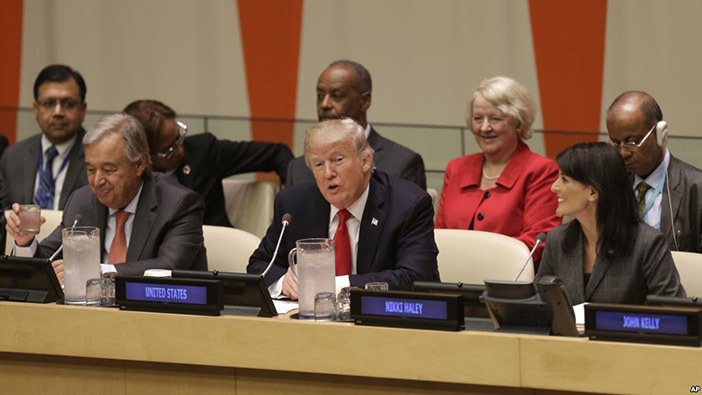 President Donald Trump will chair a United Nations Security Council meeting on Iran this month during the annual gathering of world leaders in New York, diplomats and U.S. Ambassador Nikki Haley said on Tuesday. The United States, which holds the council presidency for September, has unsuccessfully pushed the U.N. to add sanctions on Iran. Haley has regularly attacked Iran, accusing it of meddling in the wars in Syria and Yemen. Diplomats said Iran could request to speak at the September 26 council meeting, the week of the U.N. General Assembly. Iranian President Hassan Rouhani is expected to address the assembly on September 25. The Iranian U.N. mission did not immediately respond to a request for comment. China, Russia, Bolivia and others said the situation in Nicaragua was not a threat to international peace and security and therefore should not be discussed by the council. The United States has the nine votes required to block a procedural vote expected to be called by Bolivia, diplomats said.